The next entry in "Deb Eats Through the Alphabet" are enchiladas. I eat tacos and rice and refried beans and nachos. That pretty much sums up my cooking anything resembling Mexican. I do have Oaxacan Chicken Mole that I've made and "Mexican" hot cocoa is good. I'm given to understand the "Mexican" party of hot cocoa is to put cinnamon in it but I'm sure that's probably an "American-ized" version of liquid chocolate. Today's recipe comes from a well-worn cookbook, published in 1985. I think, because it's hard cover and missing the dust jacket, that I've had this since it was published. The sub-title of the book is "Living the High Carbohydrate Way". It's an interesting read and yes, I do read cookbooks. Not only does this one have recipes, it has a discussion on nutrition. Some 20+ years later, the information is quaint and probably not what you'd want to use as a menu for eating, but there are good recipes in the book. 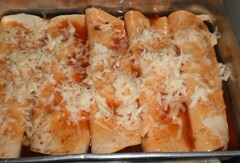 The enchilada recipe I used took 45 minutes to prepare. First, I cooked chicken breasts. That doesn't factor into my total time to prepare the meal. If you did, you need to add another 30-45 minutes to cook the chicken. You could make this with thighs if you prefer dark meat. I froze a cup of the chicken broth made from cooking the chicken. I'll use that for something later. 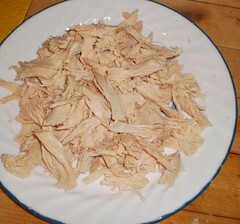 Mix a 1/2 pound of shredded chicken with 1/2 cup of shredded Monterey Jack cheese. This is mixed with a 1/2 cup of diced onion. I'm not fond of onion so I added a garlic spice mix that Carole got me for pasta. The garlic spice mix added a nice zing to the final product. Shredding the chicken and cheese brought Mija into the kitchen. I gave her a small piece of chicken. She licked it 'dry' but did not eat it. She did, however, eat the small piece of cheese I gave her, but she did not want another piece. Pilchard has no interest in human food. She sniffed the chicken and then left the kitchen. After I shredded the chicken and cheese, I heated a can of enchilada sauce to boiling. Flour tortillas were laid in the sauce until they went limp. Then they were filled with an overflowing 1/4 cup of chicken mix, rolled and placed into a baking pan. 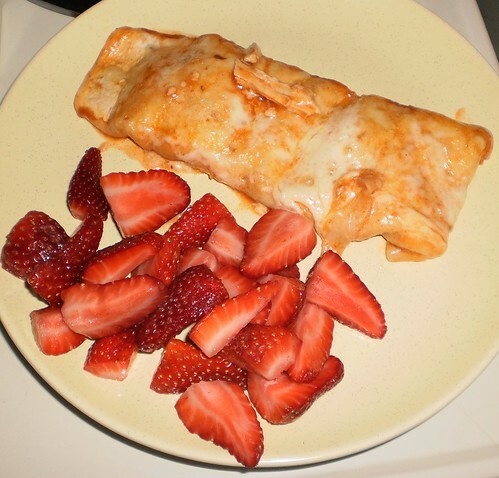 Once, all the chicken mix was rolled into tortillas, the remaining sauce was poured over the enchiladas and the whole thing topped with more shredded cheese. I like cheese so I grated a whole cup of Monterey Jack as topping. This was placed, covered, in a 350 degree oven for 15 minutes. The top was removed and it was baked an additional 8 minutes. I bought strawberries on Friday so I sliced one package and sprinkled them with a tablespoon of sugar. This was supper last night. The enchilada was huge but it was so tasty. I had two for supper so I have 2 saved for another meal and 1 with me for lunch. I have the rest of the berries and some yogurt and, well, that's a pretty good lunch for a Tuesday and a great way to start out March.